Fall - it's truly the most wonderful time of the year. Weather cools down, I can finally wear sweaters, it's prime cuddling time. I'm ready to get cozy with tons of blankets, a big mug of cocoa, and tons of good books. Also, it's finally prime time to go outside in Georgia without having a heat stroke. So, because it's my favorite time of year, I wanted to share my Fall Bucket List. This is in no way all-inclusive, but it's definitely a few good things to get me started. Honestly, there's no haunted houses on here, because I don't do good with scares. I went to a haunted house a few years ago and ended up with a rolled ankle. Go on a ghost tour. I'd love to do this in Savannah. I'd love to hear about the history and the stories associated with the area. As long as no ghosts hop in for a ride back home with me. I'd love to get going somewhere this fall (Savannah, maybe?). I love seeing different places and the leaves changing color. Duh. Here are a few on my list. Number one my list is It. In the almost 10 years I've been at the university I work at (first as a student, now as staff) - I've never been to a campus sporting event. I'd love to take my parents to see some football, because we've been doing so well these past few years! We have a local gold mine train that gets a little spooky around Halloween. I'd love to check it out with some friends! Check out a pumpkin patch. 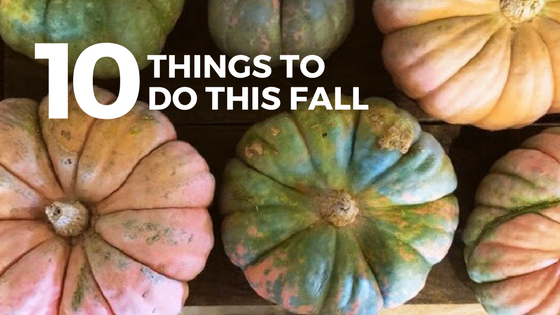 This one's a given - I've got to go see some pumpkins (heirlooms are my favorite), maybe buy a few, and enjoy the other festivities taking place (like corn mazes, hay rides, etc.). I did this for the first time last year with my sisters, and I'd love to make it into a tradition. Especially for this cause so near and dear to my heart. You can make a donation to the cause here. I love apples all year-round, but I'd really love to go pick them in their peak of freshness - the fall! Take second year of marriage pictures. Another tradition I'd like to keep up - it's important to me to record these memories each year. What are some things you want to do this fall? I just blogged about my favorite things to do in the fall, too - & a couple weeks ago, I blogged about the ghost tour I went on in Savannah, actually! It was so ridiculous & fun. Oh my gosh! I bet that was so much fun. My parents went on a Savannah ghost tour a few years ago and loved it.